Instructions: Cut a piece of white cardstock 10" x 7", score at 5" along the long side and fold to create a 7" x 5" base card. 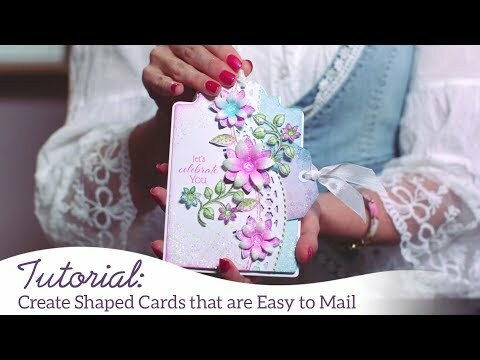 Cut a piece of patterned paper 5" x 7" and adhere to the front of the card. Die cut a frame from the HCD2-7191 Intricate Swirls Die set from white cardstock and adhere to the front of the card. Stamp the image from the HCPC-3854 Handstitched Background set in Versamark ink on watercolour paper and emboss with the CE Aurora Crystal embossing powder. Colour the card with watercolours in a random pattern and when dry trim to 6" x 4" and adhere to the front of the frame. Die cut the outer frame and the inner decorative die from the same die set from white cardstock. Add Frosting Powder to the frame and adhere the frame to the card front using foam squares. Adhere the centre die to the middle over the water colour background. Stamp the images from the HCPC-3852 Patchwork Daisy Stamp set in Jet Black ink on watercolour paper. Colour with the Zig Clean Colour Brush Markers and die cut with the coordinating dies. Shape and adhere to the bottom left and the top right of the card. Stamp the images from the HCPC3840 Buttons and Blooms Stamp set in Dark Purple ink on super White cardstock. Colour the images with Majestic Violet ink and die cut with the coordinating die. Shape and add Crystal Clear glitter to the flowers with Dries Clear glue on a damp sponge. Adhere over the flowers on the watercoloured images. Stamp the buttons from the HCPC3840 Buttons and Blooms Stamp set in Jet Black ink on watercolour paper and colour in with Zig Clean Colour Brush markers before die cutting with the coordinating die. Adhere to the centres of the flowers. Die cut the tag from the patterned paper using the HCD1-7201 Ticket and Tags Die set and adhere to the centre of the card as shown. To finish, add three small dew drops to the watercolour background.